Ever been stuck on how to respond to an angry customer or a refund request that is against your policy? We used to be too! Then we created these 8 Essential Customer Support Response Emails for our support team to use for these situations and a few more. The instant results? Happier customers. Over time, we’ve perfected these emails to add special “extras” to boring standard responses, win back customers, and increase our revenue. And now you and your support team can use them too! Check out this video for all the details, along with some incredible customer support stats that you want to know. Hello and howdy, it’s Monica here with ScriptDoll, and today we’re bringing you eight essential customer support response emails. You guys rave about our customer support, so I thought that I would give you the eight emails that we consistently use to get great results. There are lots of reasons we want great customer service, you guys, it is incredibly important to your business. How important? Well, let’s ask some of the major players that are paying attention. [00:00:30] The folks at Accenture have done a study and “estimate that the cost of U.S. customers switching companies due to poor service is $1.6 trillion.” You guys, that’s trillion with a T, okay? That’s a lot of money, and that’s not just happening in the United States. “Australian businesses lose $720 per bad customer experience.” [00:01:00] This comes from Ernst & Young, one of the largest professional services firms in the world, and you guys, where I worked my first job out of college. It’s an amazing company, and they know what they’re talking about. Just want you to think about how that one bad customer experience can happen to your business, and if you do that multiple times a month, that’s a lot of money leaving your business when it could be fixed. But don’t worry, not everything is doom and gloom. Defaqto Research, an independent financial information business lets us know that “55% of customers would pay more for a better customer experience.” [00:01:30] This means your customers are actually willing to pay for you to serve them better. I actually agree with that. I feel that way, I know that I’ve bought hosting and other things just because of the customer service. If you think about your experiences with different places, you probably have done the same. Which is why it makes complete sense that “companies that excel at customer experience grow revenues four to eight percent above the market.” This comes from Bain & Company, which is one of the top management consulting firms in the world, [00:02:00] and these are the numbers that we’re talking about, you guys. I want you to be able to deliver great customer service so that your business will get a great reputation. 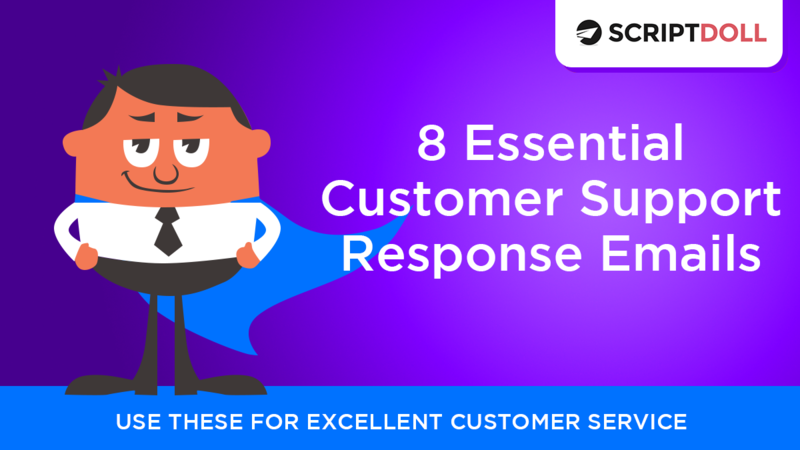 So today inside ScriptDoll, we’ve added 8 essential customer support response emails. We start off with the very first email your customer should receive after asking for help, the support request received email. [00:02:30] I’m sure you’ve gotten a lot of these emails because the main goal of this email is to let the customer know that you’ve received the request, and idly this email’s automated, and the customer receives it within one minute of asking for help. We’ve added in a few other great things for your customers like an estimated wait time, a link to the knowledge base so they can help themselves, and a little something to do while they wait. Next up is how to deal with an angry customer. You guys, angry customers happen in every single business, and when you handle it correctly, that angry customer can turn into a raving fan that will tell all their friends about how great your customer service is. Our email template gives you a way to do just that. [00:03:00] Next up is how to reply yes to a refund request. You guys, when a customer is requesting a refund, that means they’re still left with a problem that your product didn’t solve or address. So instead of just saying, “Oh sorry about that, here’s your refund,” let’s try to solve their actual problem. This template gives you the email to do that while still being respectful of their refund request. Now there are also times you need to reply no to a refund request because sometimes a customer requests a refund that is out of your refund policy timeframe, or you have a product that you don’t offer refunds on. [00:03:30] No one likes to be told no, so this email template helps soften that with an offer of help. When you do have to process a refund, don’t let that opportunity pass to gain valuable feedback. Our refund processed and gain feedback email template uses specific language proven to get a response, so that you can get all the info you need to improve your business. [00:04:00] The responses from this email have led to several changes here at ScriptDoll, including auto-say, the B to B cold email templates, and some process changes. Also as a bonus, when you do the feature that the customer requested, email them back and tell them, they may come back as a customer. The next template is the gently say no to a product request email. If you’re anything like us, people are always sending you feature requests, it’s fantastic, but we all have limited time and resources, [00:04:30] so this email’s perfect for gently saying no to your customer’s idea for your product or service that you simply can’t implement. Sometimes you need to recruit others for help to solve the customer’s problem. So the I’m getting more help response email template is perfect to send to the customer when you need more time to process the request because additional people are being asked for help, and it will take more than 24 hours. And last, but certainly not least is the give login access email. When I asked Ashton, our amazing customer happiness lead, what email we had to have in this series, [00:05:00] this is the one she said she sends the most because people are always losing their passwords or links. So sending this to the customer when they need access to the product gets them back into your product and makes them happy. To wrap up, our support desk provider, Zendesk, lets us know that “40% of customers begin purchasing from a competitor because of their reputation for great customer service.” I want you to be that competitor that customers are flocking to because of your great customer service. That’s why the 8 essential customer support response emails are now inside of ScriptDoll. Look for them in the email sequences section. [00:05:30] If you’re not a user, look below to find out how to become a ScriptDoll user today. Thanks for listening, and I hope you have a fantastic day. If you want these templates but don’t have ScriptDoll, you can try it today for $1. Just click below.